A flat panel loudspeakers system previously employed in the church did not intrude on the buildings aesthetics, but its wide dispersion in the highly reverberant space gave low perceived quality and Christchurch-based Future Media Systems was asked to propose an alternative solution. The brief was to design and install a system that would reproduce high quality speech and light music throughout the whole church, yet be as visually discreet as possible. The system needed to be simple to use, but with a full range of hidden control available. 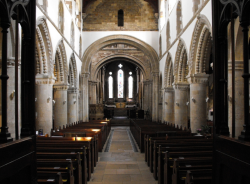 The loudspeakers are wired in four zones, to allow for flexible use of the church, with an Ecler MAP4/4000R 4-channel 2U amplifier providing good sound quality in an elegant, space-saving solution. As cables could not be channelled into the buildings fabric, to allow the use of thinner loudspeaker cables Future Media Systems wired the system as high impedance, with custom-made matching transformers. An active subwoofer enhances low frequency reproduction, principally for use when playing recorded organ music. All mixing, eq, compression and automatic mixer function are provided by a Biamp Nexia DSP and, for ease of control, Future Media Systems provided a fully customised interface using a touch screen. One control page provides just a level meter, level control and mute switch for each channel, to provide a simple interface for day to day operation. An "advanced" control page is provided for more skilled operators and this has controls for three band equalisation, input attention, and automatic mixer function for each channel, plus zone level controls, mute switches and meters. The system also provides compression on each channel, and graphic equalisers for each output, but no user controls are provided for these to simplify the interface and to prevent unauthorised adjustment. The system has the advantage that it powers up into a known state, making life as simple as possible for the operator. A Biamp Volume 8/Select 8 control panel by the church door allows a verger to control some the channel levels and to recall scenes from that position, without having to access the touch screen. This provides very simple controls for services where the number of channels and features offered on the touch screen are not required. 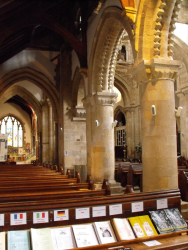 Sennheiser evolution radio microphones with active antennae and aerial distribution provide faultless performance throughout the church, even in the crypt which is below ground and under several feet of stone. Siemaszko concludes, “The key components of the system from my perspective were the MICROpoint loudspeakers, and the DSP and touchscreen for mixing and control. The MICROpoint loudspeakers give excellent reproduction and a discreet appearance at a reasonable price. We were required to fit the system without drilling into any ancient stonework and the small size and weight of the MICROpoints allowed us to do this easily as we could drill the fixings into the grout between masonry blocks. Furthermore they were lovely to set up - the system eq is almost flat. We put in a bit of cut at 230Hz to calm down a room resonance, and a bit of lift above 8kHz. Otherwise it’s completely flat and the resulting sound quality is excellent”. 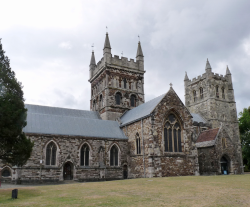 Members of Wimborne Minster congregations are agreed that they are now able to hear speakers at the services with excellent clarity and the staff and volunteers are finding the controls simple and straightforward to operate.